Definition at line 70 of file llfloaterland.h. Definition at line 228 of file llfloaterland.cpp. References LLUICtrlFactory::buildFloater(), createPanelLandAccess(), createPanelLandBan(), createPanelLandCovenant(), createPanelLandGeneral(), createPanelLandMedia(), createPanelLandObjects(), createPanelLandOptions(), LLUICtrlFactory::getTabContainerByName(), gUICtrlFactory, mTabLand, sLastTab, and tab. Definition at line 260 of file llfloaterland.cpp. Definition at line 322 of file llfloaterland.cpp. Definition at line 330 of file llfloaterland.cpp. Definition at line 289 of file llfloaterland.cpp. Definition at line 279 of file llfloaterland.cpp. Definition at line 314 of file llfloaterland.cpp. Definition at line 298 of file llfloaterland.cpp. Definition at line 306 of file llfloaterland.cpp. Definition at line 77 of file llfloaterland.h. Definition at line 192 of file llfloaterland.cpp. References mPanelCovenant, NULL, and sInstance. Referenced by LLPanelLandCovenant::updateCovenantText(), LLPanelLandCovenant::updateEstateName(), LLPanelLandCovenant::updateEstateOwnerName(), and LLPanelLandCovenant::updateLastModified(). Definition at line 181 of file llfloaterland.cpp. References mPanelObjects, NULL, and sInstance. Definition at line 212 of file llfloaterland.cpp. References LLFloater::destroy(), LLTabContainerCommon::getCurrentPanelIndex(), gParcelMgr, gSelectMgr, mTabLand, NULL, LLViewerParcelMgr::removeObserver(), sLastTab, sObserver, and LLSelectMgr::unhighlightAll(). Definition at line 267 of file llfloaterland.cpp. References mPanelAccess, mPanelBan, mPanelGeneral, mPanelMedia, mPanelObjects, mPanelOptions, LLPanelLandBan::refresh(), LLPanelLandAccess::refresh(), LLPanelLandMedia::refresh(), LLPanelLandOptions::refresh(), LLPanelLandObjects::refresh(), and LLPanelLandGeneral::refresh(). Definition at line 203 of file llfloaterland.cpp. Definition at line 154 of file llfloaterland.cpp. 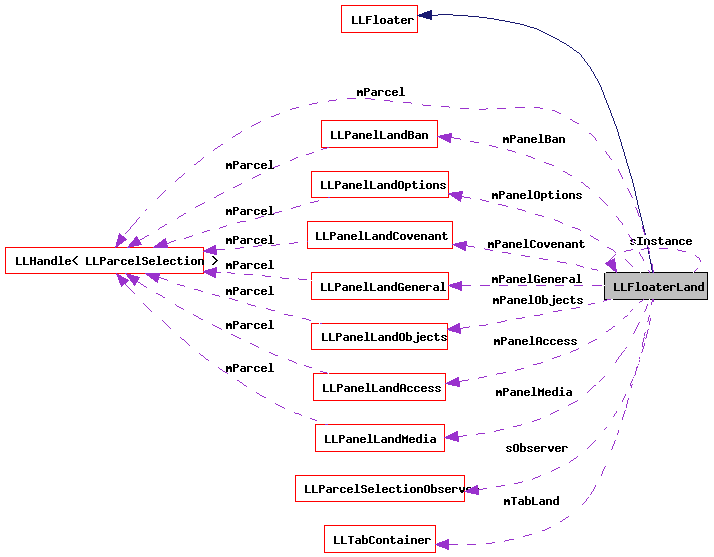 References LLViewerParcelMgr::addObserver(), LLViewerParcelMgr::getFloatingParcelSelection(), gParcelMgr, LLFloaterLand(), mParcel, mTabLand, LLFloater::open(), refresh(), LLTabContainer::selectTab(), sInstance, sLastTab, and sObserver. Referenced by LLShowFloater::handleEvent(), LLPanelLandInfo::onClickAbout(), onClickParcelInfo(), and LLToolPie::pickAndShowMenu(). Definition at line 114 of file llfloaterland.h. Definition at line 115 of file llfloaterland.h. Definition at line 116 of file llfloaterland.h. Definition at line 110 of file llfloaterland.h. Definition at line 113 of file llfloaterland.h. Definition at line 111 of file llfloaterland.h. Referenced by getCurrentPanelLandObjects(), and refresh(). Definition at line 112 of file llfloaterland.h. Definition at line 118 of file llfloaterland.h. Definition at line 109 of file llfloaterland.h. 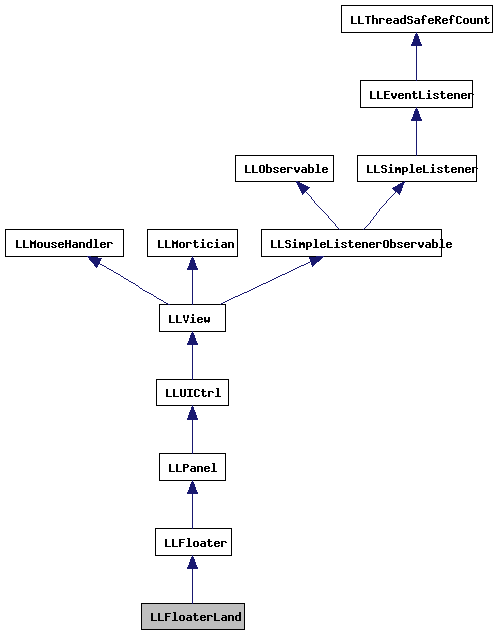 Referenced by LLFloaterLand(), onClose(), and show(). Definition at line 105 of file llfloaterland.h. Referenced by floaterVisible(), getCurrentPanelLandCovenant(), getCurrentPanelLandObjects(), refreshAll(), show(), and ~LLFloaterLand(). Definition at line 107 of file llfloaterland.h. Definition at line 106 of file llfloaterland.h. Referenced by onClose(), and show(). Definition at line 125 of file llfloaterland.h.